Discussion in 'Creative Archive' started by Xeinzeru, Jun 12, 2011. Hello everyone! 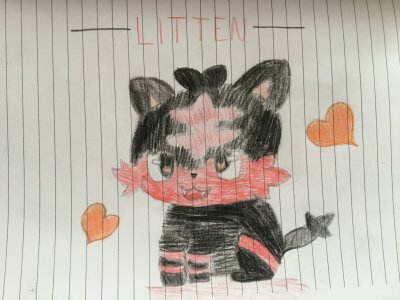 This is my first pokemon fanfiction, so I hope everyone enjoys! I do ask that you give me intelligent feedback! I would like to know what everyone thinks of this story! I will try my best to write a chapter every day, but I may not be able to post every day... but I will try! P.s. The picture is mine. :3 and is it too big? I can always resize it. "It is a gorgeous morning in the Hoenn Region!" Trilled the woman weather reporter on the television set that sat in an awkward position on the kitchen counter. A boy named Jack sat at the breakfast table in the chair closest to the sliding glass door that led to the deck. He watched with little interest as he played with his food, poking at his eggs with his fork until one finally broke. "As for the rest of the week, it's clear skies and more beautiful weather to come!" Concluded the weather announcer as they switched over to another woman for the news reports. Jack's mom, a woman with short brown hair and deep green eyes, walks in and sees jack playing with his food. "You know, it's going to get cold if you wait to long to eat." She sighed, turning to the kitchen sink to finish washing the dishes. "Yeah, I know." He answered as he began to eat his breakfast obediently after staring at it for a short while. "So what were your plans for today?" His mom asked as she dried plates and stacked them neatly in the cabinets. "Nothing really, why?" Jack asked as he finished his last piece of toast and handed the plate and silverware to his mom for cleaning. "Professor Birch wanted you to help out with the initiation of new trainers today." She exclaimed, reaching over for his plate and dipping it into the sink filled with soapy water. Jack paused to process the information, then stood from his chair and pushed it in. "Huh. Ok, when does he need me?" Jack answered as he turned off the television. "Soon, about eight O'clock." His mom replied, finishing the last of the dishes and rushed to the vacuum cleaner in the living room. Suddenly, the doorbell rang and got both of their attentions. "Could you get that?" She asked as she continued on into the living room. Jack slinked his way around the table and to the front door, wondering who it could be this early in the morning. As he opened the door, a short girl with long black and red hair with brown eyes stood at the doorsteps. Jack's eyes widen a little in surprise at the realization of his friend, Angel. "Hey!" Angel said quietly, a smile growing on her face. "Professor Birch sent me to get you just in case you might have forgotten about the initiations today." "I was just leaving actually." Jack exclaimed as he, too, had a smile growing on his face. "Hey mom, I'm going to leave now." He shouted back in the door. "Ok! Be safe, honey!" She answered as he closed the door behind him. 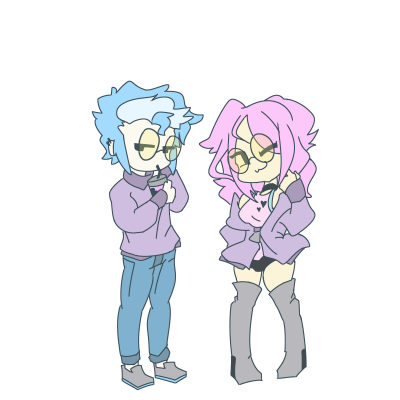 As Jack and Angel walked to the Pokemon Lab, Jack couldn't help but notice how tired Angel looked. The constant yawning is what probably gave it away. "You look tired, why didn't you sleep in today? It's unlike you." Jack asked as he shoved his hands into his pockets. "Oh, uh... I wanted to help Professor Birch out today, too!" She replied with a slight smile. Jack laughed slightly, looking over at her. "What?" She asked worriedly, as if she said something wrong. "That is unlike you, too." He exclaimed. A slight blush crosses her face as she tries to think of something to say. "Well, I thought helping the new trainers would be fun!" She said hurriedly, averting her gaze in the opposite direction. Jack just continued to laugh softly. They arrived at the Pokemon Lab exactly at eight O'clock, and the new trainers were just starting to wake. As they entered, Professor Birch was just rolling out the cart that held the three pokemon that the new trainers would choose from. "Oh, hello there Jack! Angel!" Birch greeted with the wave of a hand and a warm smile. "Hey Professor." Jack greeted as he approached the cart with the three pokeballs. "What is it we'll be helping you with today?" "Well, you see..." Birch began to explain, "the new trainers will be here between eight-thirty and nine O'clock today, I just need your help with the briefing since I'm a little more busy today than I usually am." Jack and Angel look at each other. "What exactly are you so busy with?" Angel questioned, a little surprised. "Oh, don't be too worried!" Birch exclaimed as he reached for a heavy box sitting outside his office door, "I am almost done upgrading some parts of the lab, so I only need to put together a few more things and I'm finished!" "Couldn't it wait until tomorrow?" Jack asked as he folded his arms. "I would have, but I realized some major components are down because of the few pieces that still need to be added, so I need to get those placed as soon as possible." Birch elaborated as he sat the heavy box down on a lab table near some other lab components. "I'm sure you two will be capable of taking care of the new trainers." Birch reassured them. Jack and Angel looked at each other again and smiled. "Sounds good! I always wanted to teach kids about pokemon!" Angel spoke as she clasped her hands together and shone a smile brighter than the sun. Jack smiled at her enthusiasm and nodded in agreement. The door flew open to the lab unexpectedly and everyone turned their heads in surprise to see Zach, a boy with dark greyish-blue hair and pale grey eyes, standing in the doorway with an angry, but horrified look on his face. "Did you guys see it?!" He asked everyone as he ran hurriedly inside. "See what?" Birch questioned, a bit confused, "and calm down, you don't need to shout!" Zach rushed over to a counter that held a remote and pressed a button, turning on the large, hanging television in the corner of the lab. There was the news, with the same news anchor woman from earlier, describing the terrible scene at Rustboro's Devon Corporation. Apparently, it was being overrun by members of a group called Team Magma. This is mostly a matter of personal opinion, I think you skip space out the lines too much. There's no real reason for about a hundred paragraphs consisting of one, two or three lines. A lot of the lines are easily combineable into fewer, larger paragraphs. Secondly, you seem to switch between present and past tense a lot. We like our writings to be fully written in the past tense. The door flies (This, for example, should be flew.) open to the lab, and everyone turned their heads in surprise.. Apparently, it was being overrun by members of a group called Team Magma. Other then these pointers, I have nothing to say. I look forward to see more of this, and I hope my advice has been of some help. As for the spacing, I tried doing that to make it easier to read, but if that conflicts with the paragraphs, I can fix that too! Thank you so much for the pointers! I'll make sure to apply these to the future chapters! Do you think I should edit Chapter One? I like what you have so far and I'm very intrigued with what you have planned to do with the story. The first chapter was simple and left the reader wanting more which is an excellent thing to do for a first chapter. You provided a good set up that didn't overwhelm the reader yet hooked them (or rather me) anyway. "I'm sure you two will be capable of taking care of the new trainers." Birch reassured us. Jack and Angel looked at each other again and smiled. Since your story is in third person, I think you meant to have 'them' not 'us' there. You asked about editing Chapter 1 and, in my opinion, that is totally up to you. I could recommend you either way, but in the end it is your call on whether you take my, Draft Soul's, and anyone else's advice or not. The only thing I will recommend you to do is keep writing, because this is a good story so far. Here's Chapter Two... I was hoping to get them to Rustboro in one shot, but I didn't really want to leave out Odale and Petalburg altogether... So they'll be making some minor pit stops there in the next chapter! And you'll also be finding which pokemon they each got! There they stood, astonished and amazed, at the disturbing sight taking place on-screen. Magma members could be seen in the windows holding hostages while their pokemon stood guard at exits and entrances. "It seems they are trying to penetrate the President's office!" Cried the news anchor that stood in front of the scene. Zach ran in front of the group, waving his arms in the air as he spoke. "We have to go do something!" He roared, stomping his foot as he clenched his fists at his sides. "Did you forget?" Jack began with a long, drawn out sigh, "We left our pokemon at the Day Care yesterday." Zach's hopes hit the floor at the realization. "Augh! What a time to leave are pokemon there!" Zach stomped in his little tantrum. walked over to the cart that held the pokeballs and stood thoughtfully in front of it. "Well, there is one thing you can do." Birch mentioned as the three turned to him in curiosity. As he turned around, he held out one of the pokeballs toward them. "You use these." "But those are for the new trainers!" Angel exclaimed in a sorrowful tone. "There's no time to argue. There are plenty other pokemon in the wild I can find for them!" Birch reassured, placing the pokeball in Jack's hand. Jack looked it over for a moment, then looked back up at Birch in an understanding way. "Alright. If you're sure about it." Jack replied, holding the pokeball close. "Yes, don't worry! I'm sure you three will be wonderful trainers for them!" Birch smiled. Zach grabbed the pokeball on the left and stormed out the door in a huff. Angel then took the last one on the right, holding it curiously before tugging on Jack's shirt. "Guess we better get going, huh?" She smiled, heading for the door. Jack glanced at her, then turned back to Professor Birch with a nod. "Be careful!" Birch managed to say before they were all out the door. After gathering their bags filled to the rim with supplies, Zach, Jack, and Angel, all met at the edge of town. Zach stood in front of the others, wearing his overly large jacket, exclaiming how they should stay behind him and he would take care of the dangerous stuff as he marched around in his bare feet. Jack and Angel looked at each other before letting out a few giggles. "Hey, what's so funny?! I'm trying to protect your lives here!" Zach huffs, storming off into Route 101 without them. "Someone's grouchy today." Jack exclaimed with a shrug of the shoulders, "Must've woke up on the wrong side of the bed." "I heard that!" Zach yelled in the distance, shaking a fist in the air. Angel and Jack continue to laugh until they hear Zach scream bloody murder. Concerned, they both took off for Route 101 to find Zach collapsed on the ground with an adorable Zigzagoon standing in front of him. "Aww! It's so cute!" Angel squealed at the sight of the little Zigzagoon. It tilted its head at her remark with a clueless stare. "Y-yeah, sure." Zach mumbled as he got to his feet, brushing of the bits of grass and dirt from his jacket. "Oh yeah, that's right. You're afraid of Zigzagoons, aren't you?" Jack asked suddenly as he approached the pale Zach. "You never told me that!" Angel gasped in surprise, trying to hide a huge laugh. "Oh shush! That's the reason I never told anyone! Especially you!" Zach replied with a light jitter in the sound of his voice, trying not to freak out. Angel was almost in tears trying not to laugh when Jack approached the wild pokemon. Its eyes glistened in the sunlight and the sheen of its clean fur glittered with the tree leaves. He stared at it with endearing eyes before it disappeared back into the brush. "Well, let's get going." Jack smirked before disappearing up the hill to Odale town. Angel followed immediately behind, while Zach cautiously tip-toed around the shrubs the pokemon had disappeared into before making a run for it. When they were all far off in the distance, that same Zigzagoon poked its head out of some brush under a tree. It watched them curiously before bounding off after them without a second thought. From Odale and all the way through Petalburg, Zach couldn't help but notice the small Zigzagoon following the group. He shivered at the mere thought of it before quickening his pace to keep up with Jack and Angel. "So have you guys noticed it following us?" He whispered, as if the Zigzagoon would hear him. "Yeah," Jack murmured, "It's not doing that great of a job being stealthy. Maybe it likes you." He smiled. Angel giggled a bit when she saw the astonished look plastered across Zach's face. "Seriously?" Zach whined, looking back at the wide-eyed Zigzagoon that stood with its head peaking outside of a bush. "Well, it probably won't follow us through Petalburg Forest." He pointed to the looming forest ahead. "We'll see!" Angel smiled before running off into Petalburg Forest. Once they were a good distance into the forest, the question Angel's been meaning to ask finally breaks through. "So why are you afraid of Zigzagoons?" She asked, twiddling her fingers. "Ugh, do you really want to know?" Zach sighs, scratching the back of his head. Angel nods with anticipation. "Well, uhh..." He begins, trying to search his mind for the right words. "It was my third birthday. I was outside playing when a Zigzagoon approached me from the edge of the woods. I walked over to it, and I was instantly fascinated by its tail... So I tugged on it." "Then what?" The curious Angel urged. "It, mauled my face. "He answered with a fearful expression on his face, recalling the rabid look in that Zigzagoon's eyes before it pounced his face. "Oh, it wasn't that bad, drama queen." Jack interrupted, smacking away some brush along the path. "It was just a baby, it didn't even put a scratch you." "Well when you're three years old, that can be quite traumatizing." Zach retorted, folding his arms in front of his chest as he marched forward. Suddenly, they heard a rustling in the brush to their left. "Ah! Is it that Zigzagoon?!" He squeaked. As they watched the rustling grow in size, they knew it was no Zigzagoon. Then a small girl burst out of the brushes, out of breath and slightly cut up from running through the bushes. At a closer glance, she wore a striped T-shirt with blue, slightly baggy, pants and a blue bandana around the top of her head with the Team Aqua logo plastered across the front. This took the trio by surprise as the girl looked up at them with fearful eyes. Before any of them even uttered a breath, she dashed off for the path that led to Rustboro. "H-hey, wait!" Angel blurted out before running after her. "Where is she going?!" Zach squeaked, still in surprise from the Team Aqua girl. "I don't know, but maybe that Aqua grunt might know something about Magma taking over the Devon Corp." Jack pointed out. "Yeah, maybe." Zach replied, a little uneasiness in his voice. The two boys dashed after Angel and the Aqua grunt in hopes of finding the answers they were looking for. Ths fic is looking very good, I must say. I like the story so far, and both chapters have some very good sides to them. However, it's not very hard to notice that you're somewhat new to writing (am I right?) This fic contains some errors that remind me of my first fics As I noted before, both chapters have their pros and cons. Also, one thing to note, most writers on 'Charms use the portrayal of the regions used in the anime over the one in the games, aka getting from Littleroot to Rustboro would take at least days by foot. Seeing as your characters just decided to run off to help out, you obviously think of Hoenn more as it's portrayed in the games. Yes, I am fairly new to writing fanfiction... :X I've been practicing, but I can't seem to improve. I guess it's because I don't read much, so I have little knowledge of sentence structures and such..
My written humor is not to good either as you have pointed out... ^ ^; I try though. I promise not to quit my day job. I am also extremely new to pokemon fanfictions. I don't think I have read one yet.... I suppose I should so I can get a good idea of how I should write. I've been working on a Naruto fanfiction for a long while now, but that hasn't gotten anywhere... sadly. I guess it's because I don't read much, so I have little knowledge of sentence structures and such..
Maybe you should read more. I used to be the same way, writing, but not reading much, as I just couldn't get into books. However, I eventually got into listening to audiobooks while I work, and it's helped me a great deal with my writing ever since. Just find something to read/listen to, and take some mental notes as to how the stories are written. If that's the case, there are plenty of well written Pokemon fanfics on this very board written with vastly different styles from one another. Not only are they entertaining to read, but you can improve your writing by learning from the way we write. As for your current chapter, it was a bit fast paced. As Weeds pointed out, the detail was greatly improved from Chapter 1, but Chapter 2 flew by so fast that we didn't get a chance to really immerse ourselves in the story. It would be the same as a videogame using CGI graphics for the characters standing idle. It's pretty, but doesn't help move the story along. Making Chapter 2 longer and adding an event or situation that helps things move along smoothly would greatly enhance its relevance to the story. You could easily combine what you had planned for Chapter 3 into this chapter, as long as it adds quality. Remember, you want quality over quantity. Thanks everyone for the feedback! I shall try to read some novels in hopes to improve myself once more! I just hope I don't get bored half way through... ^ ^; I will also read some fanfictions here... I am very curious about them now! !